Jane Philpott, who resigned from Prime Minister Justin Trudeau's cabinet earlier this month over the SNC-Lavalin affair, faced a barrage of tough questions from her Liberal colleagues today during a closed-door session of the Ontario caucus, sources told CBC News. Philpott addressed the group at the beginning of the meeting, which lasted 30 minutes longer than scheduled and was described by people in the room as "rough" and "uncomfortable." 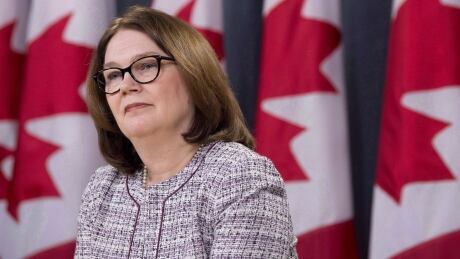 Philpott resigned from the Liberal cabinet March 4, saying in a public statement that she had lost confidence in how the Trudeau government was handling the SNC-Lavalin affair. She remains in the Liberal caucus and says she intends to seek re-election as the Liberal candidate in her Markham-Stouffville riding. Today, some of her fellow Liberal MPs reminded her that others had made compromises on sensitive issues such as medical assistance in dying — one of the key pieces of legislation Philpott fronted as health minister, along with then-justice minister Jody Wilson-Raybould. In the statement announcing her resignation from cabinet, Philpott said that after "serious reflection" on the events that have shaken the federal government in recent weeks, she concluded she must quit. "I must abide by my core values, my ethical responsibilities and constitutional obligations," she said. Earlier today, Celina Caesar-Chavannes quit the Liberal caucus, apologizing for harm she had caused through an interview with the Globe and Mail. The Whitby MP told the newspaper that when she first told Trudeau she did not plan to seek re-election, he became hostile towards her. "He was yelling. He was yelling that I didn't appreciate him, that he'd given me so much," Caesar-Chavannes told the Globe.